This recipe is adapted from one on the blog Homesick Texan. Place oats in a large mixing bowl. Bring milk just to the boiling point, watching carefully. Pour the milk over the oats. Let sit 1 to 2 hours, depending on how coarse your oats are. Mix yeast and warm water in a small bowl until yeast dissolves. Mix yeast, water, and all remaining ingredients in with the oat/milk mixture. In two greased loaf pans or on a piece of floured parchment paper, gently form dough into loaves with wet hands. Let sit at room temperature for about one hour. Heat oven to 350 degrees, using baking stone if you have one. Bake for 30 to 40 minutes, until bread is hard when you tap on top crust. Remove from oven and enjoy. 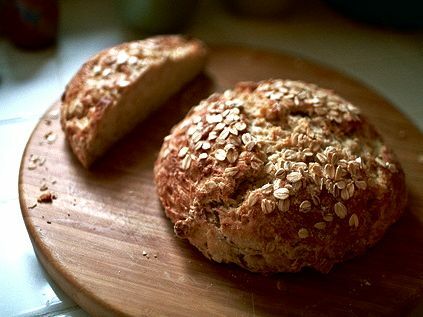 Read Sarah Gilbert's accompanying post on baking bread on Friday evening.